The paper is devoted to the application of Hartley’s transform when information is transmitted with the aid of orthogonal multicarrier modulation. This approach is shown to have a number of advantages in comparison to the ordinary Fourier transform, particularly, a possibility for diminishing the computational and hardware expenditures due to computation based only on real-valued arithmetic. It also permits us to employ identical algorithms both for the receiving and transmitting paths. The results obtained may find application in the design of radio-relay and satellite communication channels, and when using advanced network standards such as HiperLAN/2 and IEEE02.11a. Radio broadcasting systems: Digital audio broadcasting (DAB) to mobile, portable and fixed receivers, ETS 300401. Valbonne: European Telecommunications Standards Institute, 1995. IEEE P802.11D3, Wireless LAN medium Access Control and Physical Layer Specifications, IEEE Standard Department, 1996. CHANG, R.W. ; GIBBY, R.A. "A theoretical study of performance of an orthogonal multiplexing data transmission scheme," IEEE Trans. Commun. Technol., v.16, n.4, p.529-540, Aug. 1968. DOI: https://doi.org/10.1109/TCOM.1968.1089889. "Orthogonal Frequency Division Multiplexing," US. Patent No. 34884555, May 1970. BINGHAM, J.A.C. "Multicarrier modulation for data transmission: an idea whose time has come," IEEE Commun. Magazine, v.28, n.5, p.5-14, 1990. DOI: https://doi.org/10.1109/35.54342. ALDINGER, K.M. A Multi-carrier scheme for HIPERLAN. Wireless Personal Communications. NY: Kluwer Academic Publisher, 1997. BAHAI, A.R. ; BURTON, R.S. 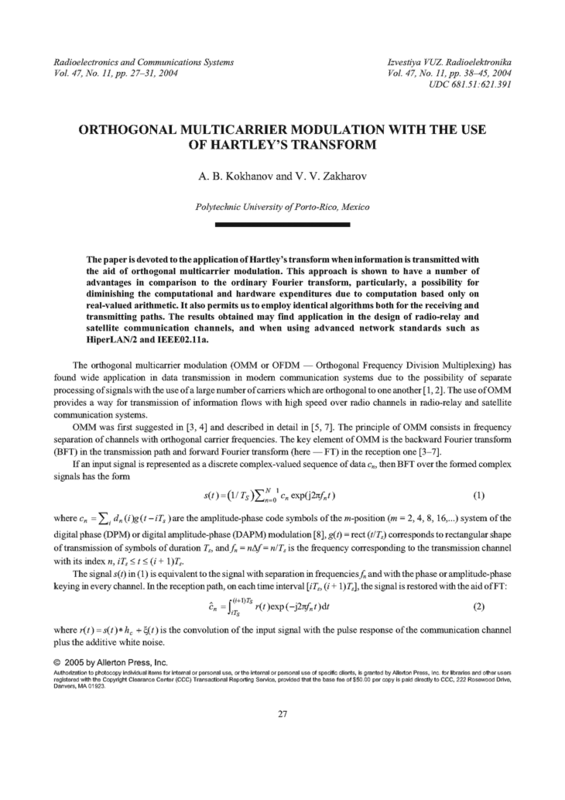 Multi-Carrier Digital Comunications: Theory and Applications of OFDM. NY: Kluwer Academic/Plenum Publishers, 1999. ZYUKO, A.G.; KLOVSKII, D.D. ; KORZHIK, V.I. ; NAZAROV, M.V. Theory of Electric Communications. Textbook for Higher School [in Russian]. Moscow: Radio i Svyaz’, 1999. LATHI, B.P. Modern Digital and Analog Communication Systems. NY: Oxford University Press, 1998. OPPENHEIM, A. (ed.). Applications of Digital Signal Processing. New Jersey: Prentice-Hall, 1978. HARTLEY, R.V.L. "A more symmetrical Fourier analysis applied to transmission problems," Proc. IRE, v.30, n.3, p.144-150, 1942. DOI: https://doi.org/10.1109/JRPROC.1942.234333. BRACEWELL, R.N. The Hartley Transform. Oxford University Press, 1986. SABANIN, B.P. "The discrete Hartley transform and its application," Problems of Nuclear Science and Technology, Ser. Mathematical Simulation of Physical Processes, n.4, p.75-84, 1997. BRACEWELL, R.N. "The fast Hartley transform," Proc. IEEE, v.72, n.8, p.1010-1018, 1984. DOI: https://doi.org/10.1109/PROC.1984.12968. SHIKHOV, M.S. "The discrete Hartley transform for experiment automation systems," Preprint of AS BSSR, n.22, 1982. KOKHANOV, A.B. ; ZAKHAROV, V.V. "Efficient calculation of digital convolution based on fast Hartley transform," Radioelectron. Commun. Syst., v.47, n.4, p.30-33, 2004. URI: http://radioelektronika.org/article/view/S0735272704040065.